There’s a celebration at the Mystic Lakes. The eagles are here. A bald eagle flies over the Mystic Lakes in Medford. On a sunny but cold and windy morning, Jim Renault and Ken Stampfer stood on the Mystic Lakes Dam near the Medford Boat Club. With binoculars, they scanned the sky and trees along the shore. Renault, a retired accountant from Arlington, pointed out a large brown blob in a tall tree on the edge of Lower Mystic Lake, about a quarter-mile from the dam. Through Renault’s high-powered camera lens, a majestic-looking bald eagle came into focus. After about an hour, an eagle appeared overhead, calling and circling above the dam, its signature white head and tail and big, broad wings in stunning relief against the bright, blue sky. 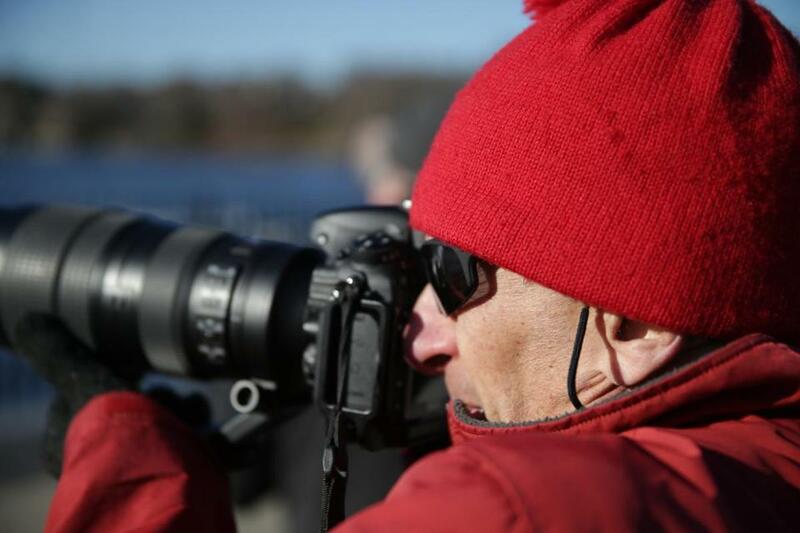 The Mystic Lakes, which are bordered by Arlington, Medford, and Winchester, have become a popular hangout for bald eagles, and for bird-watchers who like to photograph them. “My first sighting of an eagle was one of the highlights of my photographic life,” said Stampfer, an ophthalmologist from Belmont. Sherry Leffert of Cambridge got this close-up of an eagle feeding on fish caught in the Mystic Lakes. At a recent exhibit and contest at Hunt’s Photo and Video in Melrose devoted to photographs of Mystic Lakes bald eagles, one of Stampfer’s pictures took second place. Speaking at the exhibit, Paul Roberts of Medford, founder of Eastern Massachusetts Hawk Watch and an internationally recognized hawk expert, told the audience that while watching hawk migrations at Mount Wachusett in Central Massachusetts in 1978, he saw 13,000 hawks in a month, but only one eagle. Roberts recalled a day in 2014 when two women, a mother and daughter, came to enjoy the spring weather. He invited them — along with a married couple who were also there that day — to use his high-powered telescope to look at a female eagle perched nearby. The elderly woman — who Roberts later found out was 98 — shuffled over to the telescope at her daughter’s urging to take a look. She leaned forward, and put her right eye (the good one) to the lens. 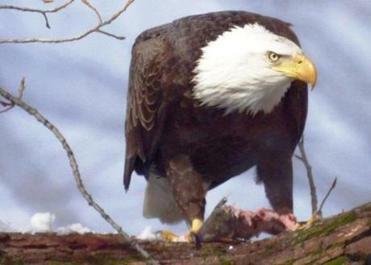 It wasn’t always so easy to admire a bald eagle, here or anywhere else in the United States. According to a 2015 fact sheet issued by the US Fish and Wildlife Service, in 1782 — when the bald eagle was adopted as our national symbol — there may have been as many as 100,000 nesting across the country. But by 1963, only an estimated 487 nesting pairs remained, because of habitat destruction, deliberate killing, and the pesticide DDT, which eagles ingested from eating contaminated fish. In 1978, bald eagles were listed as endangered throughout most of the lower 48 states. With protection, and with the banning of DDT in 1972, bald eagles made a remarkable comeback. The most recent population figures from the Fish and Wildlife Service estimate there are nearly 10,000 nesting pairs in the lower 48. According to the Massachusetts Division of Fisheries and Wildlife, bald eagles were extinct in Massachusetts during the early 1900s. But from 1982 to 1988, 41 young bald eagles from Michigan and Canada were relocated to the Quabbin Reservoir, and they were breeding successfully by 1989. Roberts said that he photographed his first Mystic Lakes bald eagle in 1998, and now, 12 to 15 are typically seen there from late December until early March. 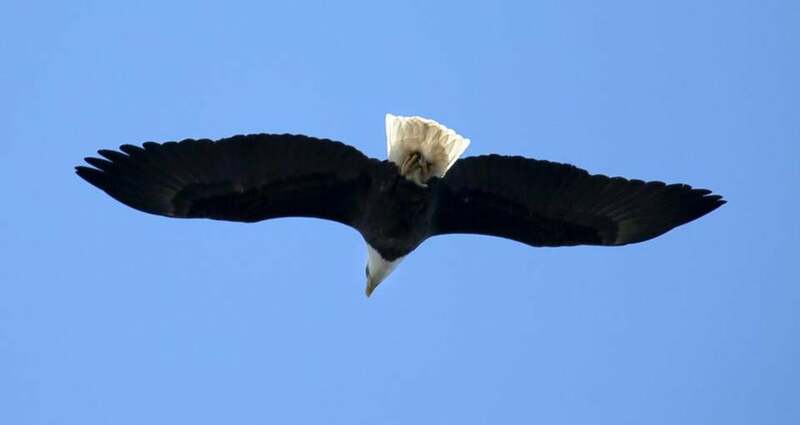 Until recently, eagles at the Mystic Lakes were primarily wintering birds from up North, said Roberts, but in the last few years increasing numbers are staying throughout the year. Roberts said that bald eagles are drawn to the Mystic Lakes primarily because the dam/spillway between Upper Mystic Lake and Lower Mystic Lake keeps parts of the lower lake ice-free during the winter, which allows the eagles to catch fish and waterfowl in the open water. Roberts said there are also a number of tall, mature trees along the shores, affording a variety of good perches. A big oak next to the Medford Boat Club is referred to by eagle-watchers as “the tree” because eagles like to perch there. Patrick Herron, executive director of the Mystic River Watershed Association, said the Mystic Lakes have the largest herring run in Massachusetts, estimated at about 630,000 fish that spawn in Upper Mystic Lake. The eagles are starting to zero in on the lakes because they’re a good source of food. Roberts said eagles have not nested on the Mystic Lakes yet, but are nesting within Route 128. Eagles now are occasionally seen at Horn Pond in Woburn and Spy Pond in Arlington. The majestic birds grow to 30 to 32 inches tall, and have a wingspan measuring 6 to 7 feet. While male bald eagles weigh between 7 and 10 pounds, females are larger, weighing up to 14 pounds. They mate for life, and may live up to 30 years. The Mystic Lakes eagles were the stimulus for a local bird club. According to Marj Rines, founder of the Menotomy Bird Club, based in Arlington, it was around 2002 when eagles started to show up pretty regularly, and people gathered at the dam to see them. “I give all the credit to the eagles for being the genesis of the MBC,” Rines said. Andy Hrycyna, a watershed scientist at the Mystic River Watershed Association, said the return of the raptors is a prime example of how nurture can help nature. Ken Stampfer lines up a shot of an eagle. “My first sighting of an eagle was one of the highlights of my photographic life,” said Stampfer, an ophthalmologist from Belmont.